In the previous chapter, the EMP-AF was proposed to perform an empirical analysis of domain ontology usage. The empirical analysis, through its observed factors such as the relationship between different ontologies based on an entity’s semantic description, ontology component usage, contextual description, and provision and availability of knowledge patterns, helps us to understand the uptake and adoption of domain ontologies on the Web. In other words, it gives a comprehensive analysis of the “usage” aspect of a domain ontology and its components. 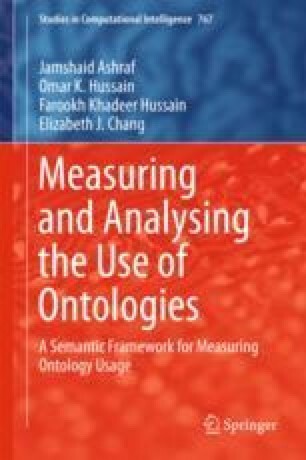 While the insights obtained through EMP-AF highlight the key aspects of the usage dimension, two other dimensions warrant consideration to fully realize the perceived benefits of Ontology Usage Analysis (OUA), as mentioned in Chap. 3, and to enable the quantitative analysis of OUA. These are the “technology” and “business” dimensions, which also have a direct relationship with ontology adoption and usage.